THIS EVENT HAS BEEN RESCHEDULED FOR FRIDAY MARCH 9 @ 7PM, EDINBURGH NAPIER’S MERCHISTON CAMPUS (IN BRUNTSFIELD), ROOM G24. 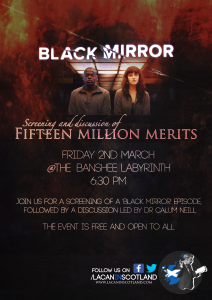 Join us at the Banshee Labyrinth for a screening of the Black Mirror episode “Fifteen Million Merits”, followed by a discussion of possible connections with Lacanian psychoanalytic theory – exploring notions of escapism, sexuality, and capitalism as depicted in this episode. Black Mirror is a TV show consisting of independent episodes which satirically question the role of technology in modern society. We will be screening and discussing the “Fifteen Million Merits” episode which follows Bing’s (Daniel Kaluuya) search for something other than the monotonous, capitalistic and technology-driven reality he finds himself in. The discussion will be led by Dr. Calum Neill. Calum Neill is an associate professor of psychoanalysis and critical theory at Edinburgh Napier University. He also teaches critical psychology and discourse analysis and is the author of ‘Without Ground: Lacanian Ethics and the Assumption of Subjectivity’ (Palgrave, 2014) and the forthcoming Jacques Lacan: The Basics (Routledge: 2018). He is also the editor of The Palgrave Lacan Series and the co-editor of the forthcoming four-volume companion to Lacan’s Écrits (Routledge, 2018).